Colonial goose - A roast leg of lamb, deboned, stuffed with honey and dried apricots, and marinated in red wine. This recipe was developed by the early colonial pioneers of New Zealand, who wanted to emulate the taste of goose, but had to make do with sheep. Fish and chips - Like British fish and chips, this dish consists of deep-fried fish in batter or breadcrumbs, served with fried potatoes. 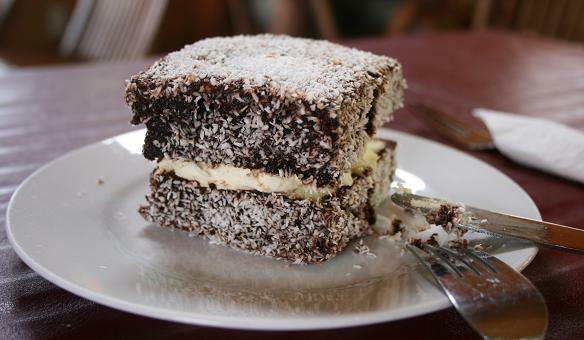 Lamingtons - Cubes of sponge cake, covered with chocolate icing and dessicated coconut. The cubes may be sliced in half, and a layer of cream or strawberry jam spread between the halves. ANZAC biscuits - New Zealanders claim to have invented this dish, but the dish is also claimed by Australia. ANZAC biscuts are made from rolled oats, coconut and syrup. According to legend, they were first prepared for the ANZAC troops sent to fight in the Gallipoli campaign in World War I, the recipe being specifically designed so as to produce a biscuit that would preserve well. 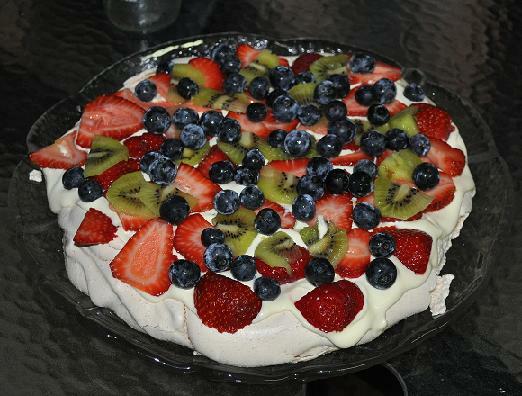 Pavlova - A meringue with a crispy exterior, but light and fluffy on the inside. As with ANZAC biscuits, both Australia and New Zealand claim to have invented the dish.